Recently there was comotion in the waiting room as one of our clients, Jackey and her son, Adam (pictured here) came across the most unusal stray – an Eastern Water Dragon! They had come across him at Dendy Park. So Adam, along with his friends Anastasia, Andy and Sophie managed to catch the gorgeous creature and bring him into the clinic. He stayed with us at the clinic whilst Adam and his friends door knocked the houses around Dendy Park until they stumbled upon his owner. It seemed that someone had left a door open and our good friend decided to take himself to the park! He was so lucky that he stumbled upon Adam and not a hungry dog! The moral of the story, is that microchips are a great way to reunit your pet with you! 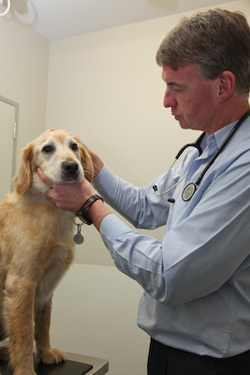 Many birds and exotic pets can be microchipped which saves enormous heartache. Years ago Anna had come across a stray ferret that was back with it’s owner in no time thanks to a microchip! 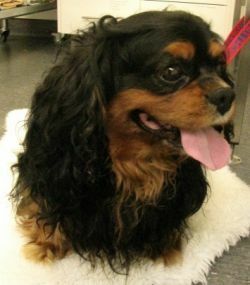 Just before Christmas, a gorgeous Cavalier King Charles Spaniel presented to our clinic. He was lost and found by Diana and her friend on Dendy Street. Doing the right thing she bought in to our clinic and we were all relieved when we scanned him and he had a microchip! But our elation was short lived as he changed homes 5 years previously and the details retained by Microchips Australia were not updated. Fortunately his owners were found and his Microchip details updated! This serves as a reminder that there are limitations with microchips – that if you change your details then YOU need to change the details held by Microchips Australia.